Many homeschooling parents begin to think about the annual assessments for their children at this time of the year. In around 20 states these tests are required by their homeschool laws. Washington State is one of those and allows for two types – standardized and non-test assessments. Standardized tests – While some are administered in online formats, they have traditionally been administered by having the student fill in the bubbles on an answer sheet. They are then normed and standardized meaning that they tell you how your child compares to a representative 99 others. Further, they are to be administered according to set rules and times. Non-test Assessments – In the Washington State homeschool law these are not defined per se, but they are to be administered by a certified teacher currently working in the field of education. Since the assessments are not defined, qualified test administrators use a variety of measures – some more subjective and others more objective. Assess a starting point in your homeschooling (given before you begin or early on). Using the same instrument of assessment before and after provides comparable scores. Assess whether the curriculum, learning styles or methods you are using are helping your child learn. Provide preparation for your child to take college entrance tests in the future. Provide objectives or ideas for study for the next year, semester or month. Identifies areas that the child may need some additional help. PIAT-R (Peabody Individual Achievement Test-Revised) Given orally – General Information, Reading Recognition, Reading Comprehension, Math, and Spelling. Optional – evaluation of a one-page writing sample – corrected with criteria that you receive along with an instructional lesson for one area of concern. Neurodevelopmental Screening (auditory and visual processing; dominance). A brief consultation with parents. Fulfills requirement for annual homeschool assessment in Washington State. Especially good for younger students and those who have a difficulty in taking tests. Time: About 1 ½ hour for the student and time with the parent to discuss results and answer questions. In addition, diagnostic assessments are available using KeyMath. KeyMath-R serves as a supplement to the Brain Training Assessment or Non-Test Assessment or as a stand-alone diagnostic math test for pre-high school skills. Success for high school math depends on a good foundation. Cost: $60.00 Time: About 1 ½ to 2 hours. If especially interested in assessing math, but want this to be the annual assessment, spelling and reading can be added. Depending on the results of the NTA or the BTA and the goals of the parents, families may be offered access to one or more of our professional accounts with Scientific Learning’s Fast ForWord or Reading Assistant, HearBuilder and Sensory Enrichment Therapy. Also, parents may choose to add Brain Training as ongoing support provided via video conferencing. Another option for determining abilities that need to be developed Unlocking Learning Potential provides Structure of Intellect online assessment, training modules, and support. Dr. J.P. Guilford designed an assessment that decreased the attrition rate of dropouts out of pilots during WWII. Drs. Mary and Robert Meeker further developed this model of assessing and training different learning abilities. We are currently scheduling through the end of June. Have you or a loved one received a diagnosis of “developmental dyslexia” or “dyslexia”? Have you or a loved one struggled with learning to read – no matter what methods and curricula have been used? Research leads us to more answers to our questions and more solutions for those who struggle. How would you feel knowing your student would have more tools to succeed in life? What would it be like for him to learn fascinating information on his own? What would it be like to be carried off to a faraway time and place by reading a great story? Now, more and more look to these areas and some additional areas: genetics, environmental, and perceptive/cognitive differences. With the use of fMRIs we can see what is going on inside the human brain. In a recent webinar, neuroscientist, Dr. Martha Burns, reported new research that confirms how these factors interact to present different kinds and degrees of learning challenges. Not surprisingly the research shows that reading and language share specific parts of the brain that includes both the visual and auditory areas. While searching for the cause and effect relationship within genetic factors, researchers learned that the brain of an infant show signs of genetic causes of learning challenges discovered later. In 2017, Gaab published findings that 50% of children with a sibling or parent with dyslexia were likely to also receive a diagnosis. This number rose to 68% in identical twins. Finding the underlying cause leads us to specific strategies for the individual since all of these factors combine in different ways. At Unlocking Learning Potential / Family Academy Online we address reading challenges using the neurodevelopmental approach ( www.unlockinglearningpotential.net) as well as with Scientific Learning’s Fast ForWord and Reading Assistant. Dr. Martha Burns, of Scientific Learning, says that Scientific Learning programs paired with an effective curriculum provide the best outcome for our children. My name is Z.C. 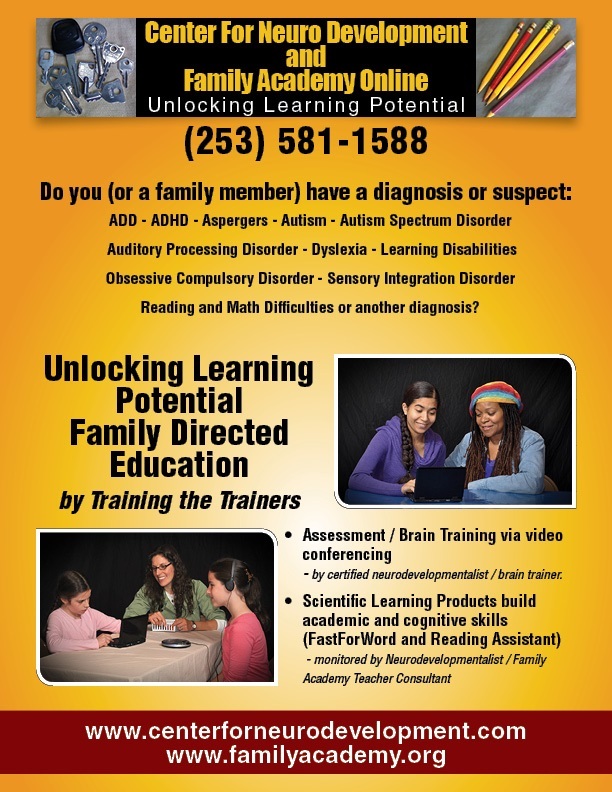 I began working with the learning specialist at Unlocking Learning Potential in 2009. By 2011 I could see how I had grown tremendously with my education and learning. With the neurodevelopmental evaluation, I found out that I was far below my grade level academically. At first, I thought the activities were silly, futile and would not work, but as I kept doing them I started noticing the big differences in every area of my learning. I could read faster, comprehend more, my vocabulary increased, and my memory improved.” Z.C. graduated from high school in 2011. Watch this video to learn more about these scientifically based solutions to learning challenges. Plus, learn how you can unlock your child’s learning and reading abilities. Personal Reflections 2017 – # 19 – How did the online part of Family Academy Online and Unlocking Learning Potential begin? Prior to 2004, the Jiles family lived in Olympia, Washington. They drove to Lakewood, Washington to attend Academy Northwest classes at our learning center. Then the dad’s work took them to Georgia. There they met the Robinson family. I worked with the Jiles family and Tim Robinson. Later the Jiles moved to Spokane and the Robinson family moved to Texas. I continued to work with them via long distance and these students graduated. Also around that time, Ariel from New Jersey worked with me and graduated early from ANW. She has gone on for graduate work. I never met Tim and Ariel in person. Our use of the internet and the phone was problematic, but we were able to get the job done. Further, my learning center students in Lakewood posted assignments and responded in a closed Yahoo group. Much has happened since that time. For one thing, we access virtually (no pun intended) all of our students online. Thankfully, our access to the internet is exceptional by comparison. Video conferencing provides a great video and audio experience with minimal problems most of the time. We can access many of these services for free or at least a minimal charge. Some do cost more. For that reason, our students can access one or more of the following as appropriate: http://www.SpellingCity.com, Scientific Learning’s Fast ForWord and Reading Assistant, www.hearbuilder.com, Structure of Intellect assessments, and G-Suite for Education. I would rate simultaneous correction of writing assignments on Google Drive as my newest favorite tool. Have you been frustrated by trying to find the cause of your child’s learning struggles? Do you suspect that it could be Dyslexia or Attention Deficit Hyperactive Disorder (ADHD) or auditory processing disorder (APD)? I frequently hear from parents how difficult it is to get the right diagnosis and treatment for their child, especially when many learning or attention issues can look very similar. Customized solutions to learning challenges. Teachers and parents may feel like their children are not trying, not paying attention, or being disruptive when in fact what’s happening is that they try to pay attention but can’t follow what’s being said and eventually give up. These children may also receive a diagnosis of ADD or ADHD or APD or even Dyslexia but fail to see progress. If your child exhibits any of these difficulties, we can help you address the underlying causes for these learning struggles. We offer Scientific Learning’s online products (Fast ForWord, Reading Assistant) at a low cost. Also, we offer personal online Brain Training Assessments and Brain Training. This whitepaper is always a popular resource when we promote it. This is a great one to keep in your office or to email out in response to the email included above. This has also been added to the resources page. Heim, S., Choudhury, N. & Benasich, A. A. (First online: 15 December 2015).Electrocortical Dynamics in Children with a Language-Learning Impairment Before and After Audiovisual Training. Brain Topography. Summary: After Fast ForWord use, children with language learning impairment (LLI) showed improved language skills and changes in patterns of neural activity that indicate “a change in cognitive control strategies.” This is consistent with other recent neuroscience studies on children with and without LLI (Stevens et al., 2008) and children with dyslexia (Temple et al., 2003). All of these studies suggest that the improved language and literacy performance seen after Fast ForWord use may result from better application of attentional and memory resources. Heim, S., Keil, A., Choudhury, N., Thomas Friedman, J. & Benasich, A. (2013). Early gamma oscillations during rapid auditory processing in children with a language-learning impairment: Changes in neural mass activity after training. Neuropschologia, 51, 990-1001.Krishnamurti. Summary: The authors concluded that measures of brain wave efficiency are not only correlated with auditory processing problems in children with language-based learning disabilities, but that the Fast ForWord Language program improves at least one measure of the brain wave efficiency and that is in turn correlated with improvements both in rapid auditory processing accuracy and also language skills. Krishnamurti, S., Forrester, J., Rutledge, C., & Holmes, G.W. (2013).A case study of the changes in the speech-evoked auditory brainstem response associated with auditory training in children with auditory processing disorders. International Journal of Pediatric Otorhinoloaryngology, 77, 594-604. Summary: After Fast ForWord use, the authors noted significant changes indicating plasticity in the auditory brainstem’s neural activity to speech stimuli. Developmental dyslexia, characterized by unexplained difficulty in reading, is associated with behavioral deficits in phonological processing. The results of this study suggest that a partial remediation of language-processing deficits, resulting in improved reading, ameliorates disrupted function in brain regions associated with phonological processing and produces additional compensatory activation in other brain regions. This study showed effective remediation with the children with developmental dyslexia, and that disrupted brain responsiveness to rapid auditory transitions of non-verbal sounds may be a risk factor for developmental dyslexia. Effective remediation through Fast ForWord® can foster neural plasticity that enhances brain responsiveness to rapid auditory transitions as well as improves language and reading skills. Want to use the summer for great benefit and also provide a change of pace for your child? Want to have a Teacher Consultant to help you plan and be available throughout the school year? Want to see if there are underlying learning challenges that affect the way your child learns? One parent who has had their children in the program since February, 2013 reports, “My child has taken off with reading.” Another likes the option of having a child work a little more independently with the assurance that the time is spent productively. Even a mom whose son just began in September is thrilled with progress just a few weeks into the program. Another student scored 4 months higher in his first 6 weeks of using Fast ForWord. Scientific Learning’s Fast ForWord develops and strengthens memory, attention, processing rate, and sequencing – the cognitive skills essential for reading. By strengthening these skills, we see improvement in a wide range of critical thinking and reading skills such as phonological awareness, phonemic awareness, fluency, vocabulary, comprehension, decoding working memory, syntax, grammar, and other skills necessary to learn how to read or to become a better reader. In over 250 studies, research indicates that learners can see achievement gains of 1-2 years in as little as 8-12 weeks. While Fast ForWord is a literacy based program, studies that monitor progress confirm that it also improves other areas because Fast ForWord teaches one how to learn. Fast ForWord is definitely based on the now, well accepted concept of neuroplasticity that extends throughout life. Interactive activities of this program follow the important concepts of short, frequent, intense (i.e. full focus) that distinguish neuroplasticity. Fast ForWord is a learning accelerator with recommended protocols of 30 – 50 minutes 5 times a week (ideally the daily sessions are spread throughout the day in 10-15 minutes sessions.) More recent studies state that children can even make progress with a 3 day protocol. Scientific Learning’s Reading Assistant which improves reading fluency and comprehension. Once a student has progressed far enough in the Fast ForWord products, we have the option of moving them into Reading Assistant for one or more ten week session. Our next Fast ForWord / Reading Assistant session begins June 22, 2015. Those interested should contact us as soon as possible to get on the list. We also provide online Family Support or Brain Training. Family Support provides assessments for all of the children who are enrolled in Family Academy Online and consultation throughout the enrolled period. Our Family Academy Online Teacher Consultant will help the parent plan the school year and meet periodically. Our Brain Training option begins with an assessment and then the student and parent have frequent video conferencing (some time with student and some time with parent to help with brain training at home). For example our Neurodevelopmentalist / brain trainer meets with the family two times a week for 30 minutes. As a part of the Assessment / Brain Training path, families may choose online programs such as Fast ForWord, Reading Assistant, Samonas Sound Therapy, Hear Builder and Spelling Vocabulary City. Our neurodevelopmentalist will use parent observations and the assessment to work with the parent to customize the optimal program for the child. These options have less rigid start times.